It’s important to receive the right information when looking into franchising as a whole. With so many avenues of information, it can be difficult to decide what sources to trust and which paths to follow. But, for example, the information that the web can offer is nothing compared to actually having some face-to-face time with experts in the industry, as well as talking to people who have faced the similar issues, frustrations and concerns as yourself. As we know, franchising is a multi-billion pound industry, generating a turnover of £17.2bn in 2018, up £2.1bn since 2015, as reported in the 2018 BFA/NatWest Franchise Survey. With an industry this big, generating one per cent of the UK GDP and employing more people than Tesco, Asda and Sainsbury’s combined, it’s important that you hear the right voices, follow good advice and meet franchise businesses that see you’re serious about learning and becoming a franchisee. 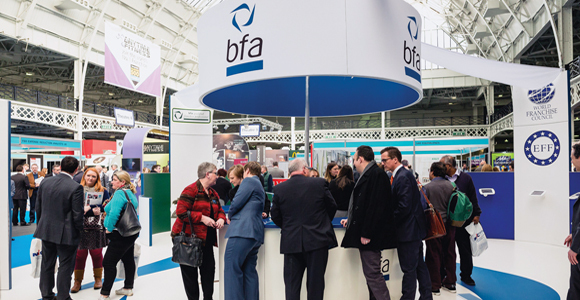 BFA accredited exhibitions are the perfect opportunity to conduct some active research into franchising. We are in partnership with The National Franchise Exhibitions throughout the year in order to allow prospective franchisees the chance to hear from accredited experts and franchised businesses, not only from their stands but through seminars that offer free advice from some of the UK’s top franchise experts on becoming a franchisee or franchisor, and feature real-life stories from people who have once been in the same position as you. It’s an ideal way to do research, make notes, and talk as much as possible to anyone that can help you on your franchising journey. Owen Barton, franchise development manager for Neighborly, a company that owns a variety of home service franchises, explains that it is very important for franchise businesses to attend. Not only does it enable them to have quality time with potential franchisees and build relationships early on, it shows that they are ethical and accredited by the BFA to be at the event. He says: “As a global franchisor, it is important that we attend exhibitions in order to grow and build our network of over 3,500 franchisees. It’s important for people looking into franchising to hear from people who were once in their shoes, which is why a lot of franchisees attend exhibitions to provide first-hand insight into what is in store for prospective franchisees. One franchisee who does this is Stuart Callister, a franchisee of Bright & Beautiful, Malvern, a professional housekeeping and cleaning service. “When I attended the National Franchise Exhibition last October with my franchisor, Neighborly, I was able to meet a number of interesting and high calibre people interested in growing a successful business. They were interested in finding out how I had gone about evaluating opportunities, finding synergy with a franchise opportunity and my journey during my first year of trading. If you want to start off your franchise journey, visit a BFA accredited exhibition this year and explore the many wonderful businesses that franchising has to offer.